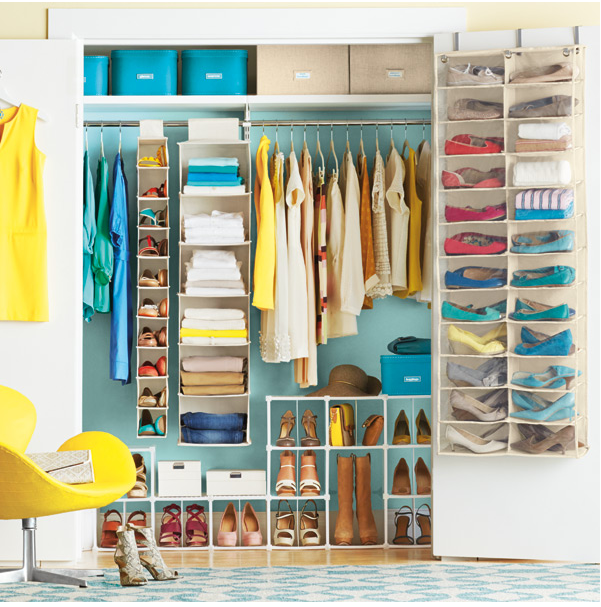 When was the last time you organised your closet? If you reluctantly skip this task every time you perform the domestic cleaning, we have news for you – you should probably do it now. If you ask yourself questions like “Where is my...?”, “ Who stole my...? !” or just state “I have nothing to wear!” you are in a desperate need to organise and declutter your closet. Don`t rely only on the seasonal cleanups – they are essential but you need your closet organised through the whole year as it will save you time, money and efforts. Usually, the only reason why people don`t do it is because they find it hard to motivate themselves to get it done. Below you will find some good reasons why you should do it today and few tips on efficient storing your clothes. To begin with, you should take everything out of your closet. Completely empty your wardrobe and place your clothes on the bed or on the floor and see what space you have to store them and organise them properly. It will also help you check what is hiding in the corners – you definitely have a cute top you have forgotten you bought last year! After you do that there is a piece of advice from your local domestic cleaners that you should totally use – wipe the whole interior of the wardrobe with a mixture of white vinegar water and few drops of tea tree oil. It will freshen up your closet and remove any bacteria. If you want a fresher scent, you can add 2 – 3 drops of lemon essential oil. Another good reason to start your cleaning session today is that you will make your wardrobe greener. In what way, you will ask. There are some items that you can reuse effectively. Cotton t-shirts that are stained or you don`t have any intentions of wearing, can make great cleaning rags. If you are unlucky and find some moth holes in your garments, you can donate them to an animal shelter as they will make good bedding. In the same line of thought, you can reuse a pair of jeans into shorts or make your leggings into a cute top (yes, all you have to do is cut the crotch of the leggings and use the leg holes as sleeves). However, have in mind that when you are donating clothes to a charity, you should donate only the wearable ones – too worn and stained ones are not to be given to other people. When you organise your closet you will find it less frustrating and you will finally be able to find what you need in a minute. Well, if you are desperate as you only made it to the part where you have placed everything on the bed, don`t give up! Pour a glass of wine, spray some nice essential oil around, lit a candle and play your favourite music. Look at that cleaning session as a therapy and soon you will find yourself enjoying the process. You will benefit from that! You will save time every morning, efforts to look up everything when you need a certain piece of clothing and money – just because you forgot you own a black dress doesn`t mean you don`t have one but when it is hiding behind the pile of underwear you will never know it is there. Speaking of convenience, if you are living on rent, it will be times easier to perform an end of tenancy cleaning when you are about to leave. If you have a crazy closet going on, you will need at least half day more to make it into a decent- looking room. When you start organising, you can be easily fooled into thinking that every item is a top priority. This never results in an efficient storage – for such case better provide your closet with extra shelves and cubicles and organise them in the most convenient way for you. For example, a good way to store your closet is to keep your woven garments hung – you are advised to use bamboo hangers. If you are storing them for a longer time, better cover them in an old sheet to protect them from dust. If you are not convinced that you should organise your home right now, we will give you few more to consider. When you put them in order, your clothes will smell fresher and they will last longer. As we already mentioned, you will find some lost treasures you have forgotten about – what is better than a free boost of your closet? When you are organising your clothes, you will be able to check for minor rips, stains and so on which will improve your wardrobe in general. You can sell some barely used formal clothes – if you know that you are not going to need them, you can make some money out of them! Last but not least, this 'therapy' will be emotionally cleansing as well – you probably need a time break from your daily routine! You have pretty good reasons listed above why an organised closet is a better closet – all you have to do is motivate yourself to begin!